May I remind you that I am not a baker? Well, I successfully made brownies that didn’t come from a box! I am so super proud of myself, and an added bonus is that these brownies were delicious. Another treat made for our friends’ moving day, and Nate was sad to see me pack almost all of them to bring with us. He kept asking if we had to give them all away, to which I responded, “yes, dear”. I found this recipe from Just Baked, a wonderful little blog with many tantalizing treats! 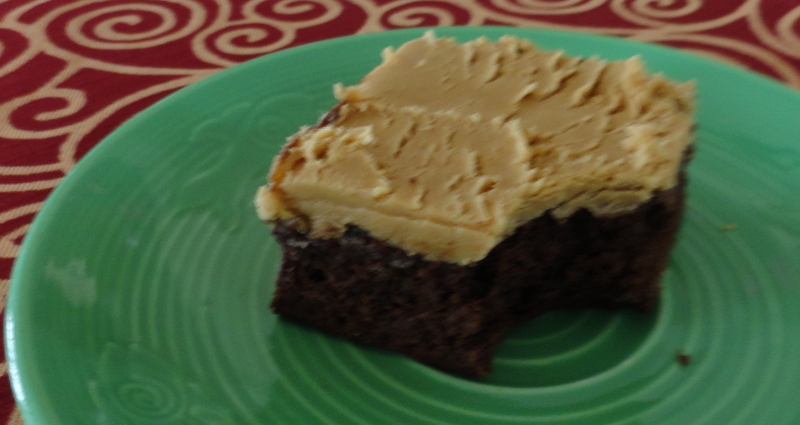 The peanut butter frosting reminds me of the Reese’s peanut butter, and paired with the chocolate brownie – YUM! 1. Preheat oven to 350 degrees. Grease 13×9-inch baking pan. 2. Combine both chocolates and butter in a saucepan over very low heat. Do not walk away and stir frequently so you do not scorch the chocolate. When melted and smooth, remove from heat and let cool to lukewarm. 3. In a large bowl, beat sugar, eggs, and vanilla with an electric mixer until mixture thickens and becomes pale yellow. Reduce mixing speed to low and mix in flour and salt. When combined, add melted chocolate and mix well. 4. Transfer mixture to pan and bake for about 20 minutes. Cool brownies completely in pan on a wire rack. 5. In a medium bowl, combine peanut butter and butter. Using electric mixer, beat until smooth. Add powdered sugar and vanilla extract and beat until well blended. 6. Once brownies are completely cool, spread with peanut butter frosting evenly. Refrigerate for at least one hour before cutting and serving.